Hyundai is gearing up for its fourth NFL season as the league’s official car and SUV. The automaker is planning traditional, digital and experiential marketing. As part of its 2018 season campaign, Hyundai is the presenting sponsor of NBC’s "Sunday Night Football" kickoff show Sept. 6 and will have the marquee presence leading into the prime-time game each week. The show has been prime-time television’s No. 1 show for seven consecutive seasons, averaging more than 18 million viewers each week last season. Innocean is developing the creative for Hyundai’s "Sunday Night Football" sponsorship. It will feature numerous branding elements, including logo animations, in-studio logos, a weekly feature, and logo placements on the broadcast’s countdown clock and scoreboard. The daylong 2018 NFL Kickoff Driven by Hyundai in Philadelphia will celebrate the return of football and honor the Super Bowl LII champions prior to the season opener. The event revolves around the NFL Kickoff Experience, an NFL theme park free to the public. As part of the celebration, the NFL Kickoff Concert Driven by Hyundai will be headlined by multiplatinum singer/songwriter Shawn Mendes. The concert will be featured on the pre-game broadcast on NBC and NFL Network and streamed online. 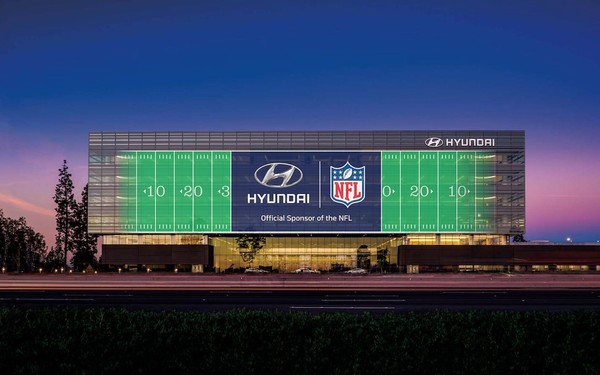 Inside the Kickoff Experience, Hyundai will have its own activation, where it will host NFL Legends for autograph sessions and offer giveaways. The automaker will also display its Santa Fe, Kona, Tucson and Veloster Turbo vehicles inside the space. Hyundai will also sponsor a three-part custom-branded content series, “Cover 2,” that will bring together a former player from both teams playing that night, who will discuss aspects of their rivalry while driving around the home-team city in a Hyundai Santa Fe. The videos will run during three of this year’s matchups (Ravens at the Steelers, Sept. 30; Rams at 49ers, Oct. 21; Packers at Vikings, Nov. 25). A 30-second version of each video will air during the broadcast and fans will be directed to HyundaiUSA.com to watch the completed piece. The automaker and the NFL are in a four-year deal ending in June 2019. Hyundai also continues its partnerships with six teams for the 2018 season: the Arizona Cardinals, Houston Texans, Los Angeles Rams, Miami Dolphins, Minnesota Vikings and Pittsburgh Steelers. Hyundai will have local activations at each home game for the sponsored teams. The kickoff and local team activations are managed by Advantage.